Ace2Three Rummy is already popular in hosting in some of the biggest online rummy tournaments with big cash prizes. They have now announced two new rummy tournaments that will test the skills and strategies of even the best players of 13 cards rummy. The rummy tournaments named Xtreme Deep Stack will reward the cash rummy players at big cash prizes depending on the number of players participating. 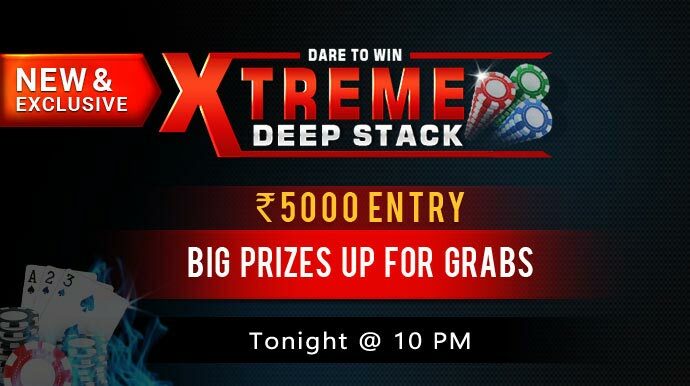 The Xtreme Deep Stack tournaments will run on every Saturday and Sunday at 10 PM and will be played in Stakes Rummy format. If you have an account with Ace2Three Rummy, this is your best time to prove your skills and win big! The Xtreme Deep Stack rummy tournaments from Ace2Three Rummy will run on all Saturdays and Sundays at 10:00 PM. The cash players can enter the tournament by paying an entry fee of Rs.5000. The games will be played stakes rummy format which makes it a fast tournament filled with adrenaline. All the players entering the tournament will be assigned with an initial 25,000 real chips. If you are new player and not a cash player yet, you won’t be able to participate in this tournament. To become a cash player, make a minimum deposit of Rs.100 and play at least one cash rummy game. Once you have become a cash player, visit the Tournaments section in Ace2Three Rummy website and click on Special tab. Register for the tournament with the entry fee and mark your dates to win big. If you are new to Ace2Three Rummy, you can read our review on their promotions, game play and features here. Subscribe to us to get the latest news on Indian rummy, tournaments, bonus offers and other deals. If you have a feedback on our articles, post it in the comment section below.